2017 was a year packed with exhibitions and events about Hadrian’s Cavalry. The Hadrian’s Wall Country consortium wanted this information to have a digital presence. They also asked me to revamp their web Learning section to make it more helpful for students and teachers. I organised scores of Cavalry documents and images into logical pages. For the Learning section, I put myself in the shoes of students and teachers. What questions did they need answering? What could help their homework the most? I saved the project time by suggesting I make edits to a hidden Learning section. This could then be made live once approved by the consortium’s Education Group. We were pushing the content management system to its limits. So being able to convert graphics, screengrab YouTube shots and even hand-code HTML all came in handy. I unearthed information hidden in Word documents to make the learning section more useful. Cross-referencing Hadrian’s Cavalry within existing pages gave it more cohesion. 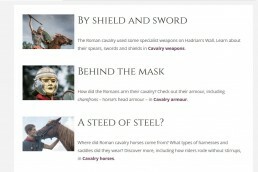 I’m particularly proud of the Hadrian’s Cavalry pages. 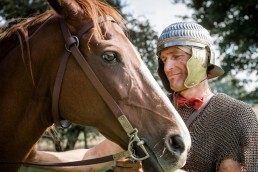 I feel I’ve created a section worthy of these elite Roman horsemen.